Amazing news that Jeff Lynne and ELO will be playing their first UK gig since 1986 this September – exciting news indeed. 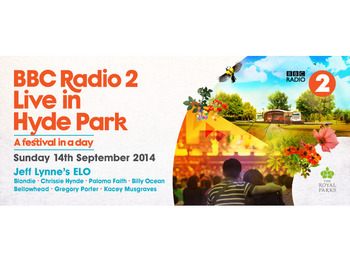 They play BBC Radio 2′s ‘Live in Hyde Park’ festival on September 14th. Pretty decent support bill with Blondie, Billy Ocean and the mighty Bellowhead. The gig has already sold out and if a success who knows maybe more UK dates? A gig in his home town at Birmingham NEC would be a must I would have thought. There will be a full orchestra backing ELO too. Not sure who will be in the band at this stage, although Jeff Lynne’s long time ELO collaborator Richard Tandy will be involved I am sure. If drummer Bev Bevan can be tempted back on stage what a line-up that would be! This entry was posted on June 16, 2014 at 3:40 pm and is filed under Classic albums, Classic rock, ELO with tags BBC Radio 2, Bellowhead, Bev Bevan, Chris Evans, ELO, Hyde Park, Jeff Lynne, Richard Tandy. You can follow any responses to this entry through the RSS 2.0 feed. You can leave a response, or trackback from your own site.